In Pisa, Italy, mad genius Enrico Dini is building sandcastles on the moon. 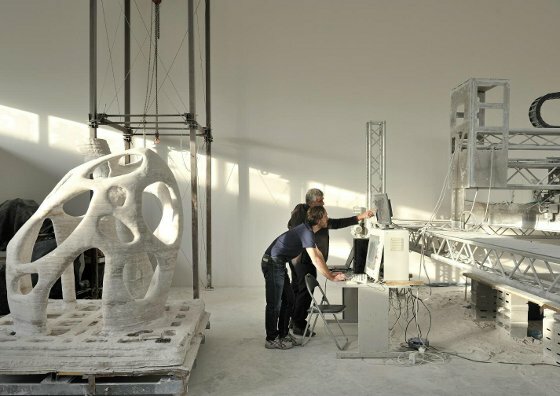 His giant 3-D printer is the first of its kind with the potential to print whole buildings, and it makes them out of solid rock, cutting down a thousand-year-long process into a few minutes. It uses sand, but someday it’ll use moon dust. 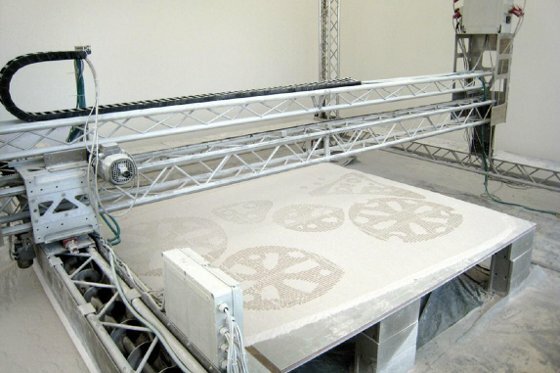 The machine, called D-Shape, sprays a thin layer of sand with a magnesium-based glue from hundreds of nozzles–its resolution is about 25 dpi, not bad for printing on this scale. The glue binds the sand into solid rock, which builds up, layer after layer, into a sculpture, or a piece of furniture or, someday, into a cathedral. “What I really want to do is to use the machine to complete the Sagrada Familia,” Dini says. Okay, it seems a little crazy, but not much. 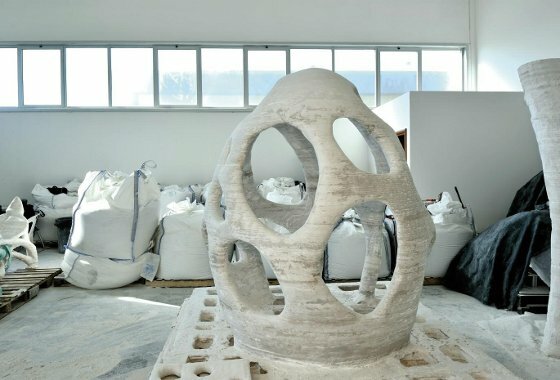 Dini claims the d-shape process is four times faster than conventional building, costs a third to a half as much as using Portland cement, creates little waste and is better for the environment. But its chief selling point may simply be that it makes creating Gaudiesque, curvy structures simple. It’s not enough for D-Shape to be the missing link between the tiny 3-D printers of today, which never really caught on beyond gimmicky jewelry and model-making, and bigger printers capable of making full-size structures. No, Dini wants the moon. As part of the European Space Agency’s Aurora program, he’s talking with La Scuola Normale Superiore, Alta Space, and Norman Foster to modify D-Shape to build with moon dust. Voila: instant moonbase.